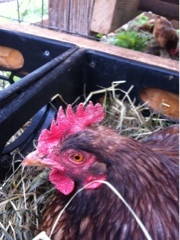 When the hens lay eggs they usually make a little noise. Egg music we call it. There are 3 nest boxes in every pen. Stuffed full of straw, the hens wind the straw down and around, creating a hollow for the eggs. The hens line up to get into a nest at certain times of the day. With 3 options, they will still lay all of them in one or two nests, and will sometimes pack three into a nest as they wait for eggs. If we had roosters and the eggs were fertile, one hen would take over the care of a clutch of eggs, setting on them until hatching. Since we are not breeding chickens but love the eggs, we pull them several times each day. And then, cook up lovely dishes with them.